"I remembered the landmarks, and we found the reef again". Lasseter never produced any creditable directions or bearings to his gold reef, his stated reasons being the inaccuracy of the watches when he and Harding returned to the reef in 1900, and his suspicion that Blakeley and Bailey would dispense with his services as the expeditions guide if they became aware of the location of the bonanza. 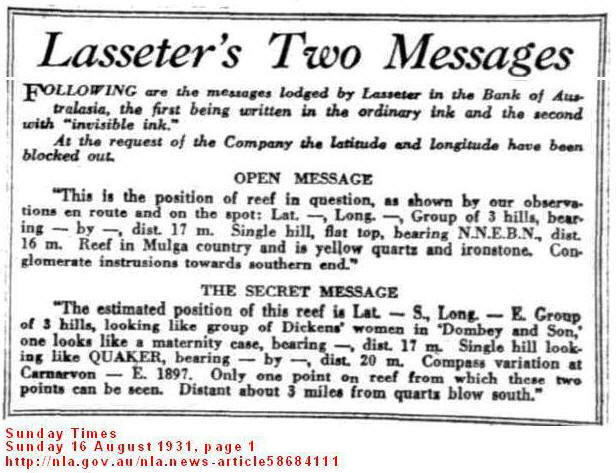 During the first interview in Baileys office Lasseter was deliberately vague, placing the reef at the western end of the MacDonnell ranges and near the borders of Central and Western Australia. Amongst other things, Central Australia is noted for its prominent and distinctive landmarks and Lasseter reassured his potential backers that, "I found it by landmarks with Harding so there's no doubt I could do it again", during the initial meeting Coote makes three references to Lasseter's certainty of relocating the reef by landmarks alone, thus making the story of the inaccurate watches quite superfluous. It was Charles Ulm who cast the first doubt on Lasseter's navigation by pointing out that by his calculations the reef was somewhere in the Indian ocean and the lapse of thirty years since he last visited the reef would make those landmarks, "slightly hazy in the mental picture after all that time", Lasseter replied that, "if you had seen that country under the conditions I did you would never forget those landmarks". Of course the reef and its unforgettable landmarks were entirely a figment of Lasseter's imagination, as Blakeley began to suspect three days out from Alice Springs when Lasseter began to 'recognise' his former camping places and other landmarks, one being an inaccessible cave high in a cliff, Blakeley decided to put Lasseter's veracity to the test regarding the nature of the country to Illbilla, "however Harry would not risk predicting what was ahead of us". By 1930 Lasseter would be seeing his landmarks for the third time, the first being from the east in 1897, then from the west with Harding in 1900, those unforgettable landmarks should be very clear in Lasseter's mind. It's probably not surprising to know that Lasseter never made a map of those landmarks, he had none to make a map of. Coote E.H. Hell's Airport 27-30. Blakeley Fred Dream Millions 20,21,65.